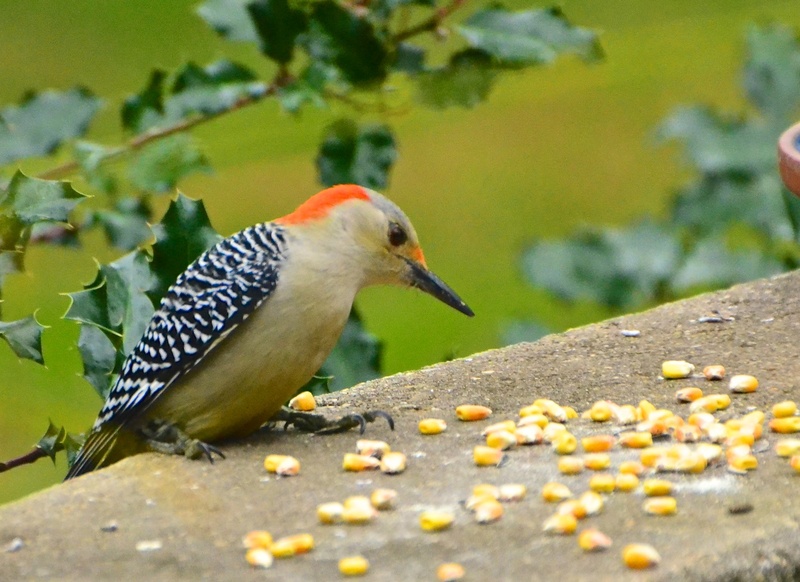 I'm always surprised when I see the Red-bellied Woodpecker eat from my patio wall. They typically like one of the feeders when I have a mix of seed and nuts. This little girl enjoys the corn I put out if she happens to get there before the squirrels discover it. She flies in and picks up a kernel and flies off to some nearby tree only to repeat this process a dozen or so times. Or until the squirrels arrive. Which usually is quite soon. I worry a bit about her doing this. If you recall, I rescued one of the woodpeckers a week or so ago from my visitor hawks. I'm not sure if it was her or her partner. I haven't seen the male lately. But this boy has been making regular visits. It was a Cooper's Hawk that attacked the woodpecker and who has been my main visitor but this guy has been coming frequently as well. 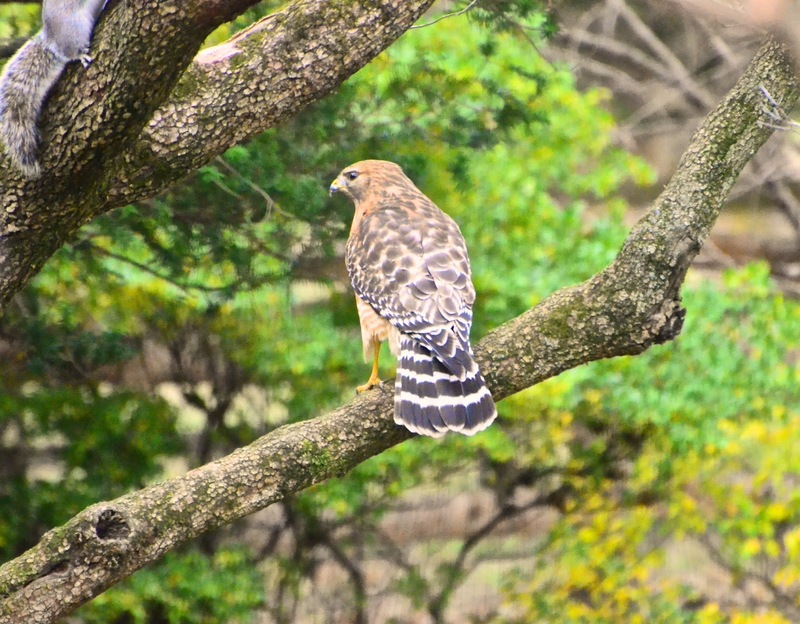 I think he is a Broad-winged hawk. You agree? 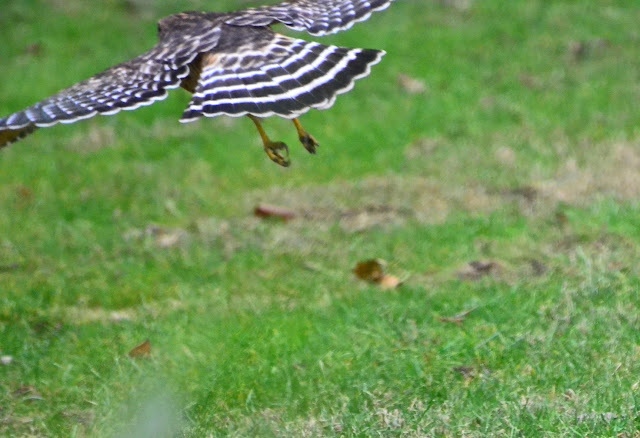 Definitely looks different than the Cooper's Hawk that has been hanging around. He comes and sits in the tree surveying my back yard. Sometimes he drops down into the yard and pulls out a HUGE worm. How does he know they are there?? If it's by eyesight, it's pretty darn remarkable! The chickadees don't seem to be frightened of him. They continue to feed. The squirrels take shelter as do some of the larger birds, who keep their distance. Until he flies off ... and the feeding continues at the feeders. This little dove would be wise not to be sleeping when he comes around again. I've lost a few doves to the hawks. Although lately, it seems the hawks haven't kept their population down. I counted 12 one afternoon feeding beneath my feeders! An even dozen! By the way, thanks for all your feedback about Picasa. I ended up upgrading to add space. Those of you that got grandfathered in at $5/yr ... lucky you! yes, poor doves are sweet but rather foolish and end up being easy prey. i love your little girl red-belly. 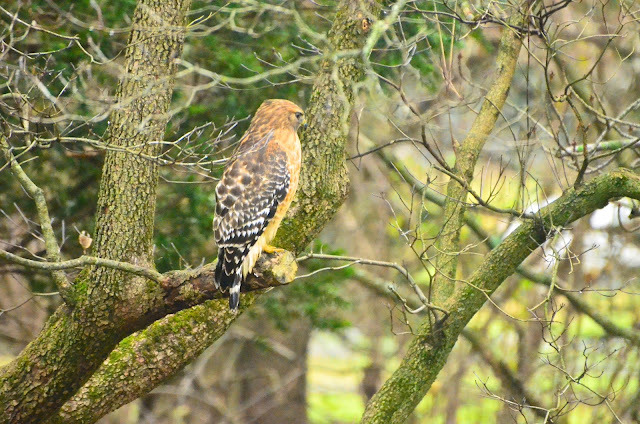 I agree on the red shouldered hawk as well. We have several that haunt our neighborhood. 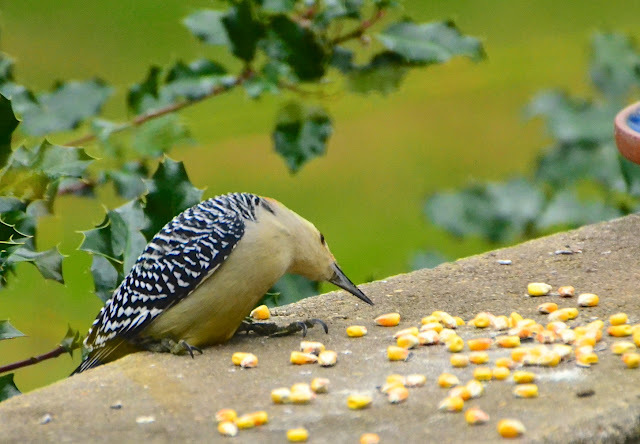 Love those woodpecker shots. I've never seen them eating at our feeder. I will try putting out some corn for them. Not to be too hard on pretty creatures, but I've found doves to be rather dumb. 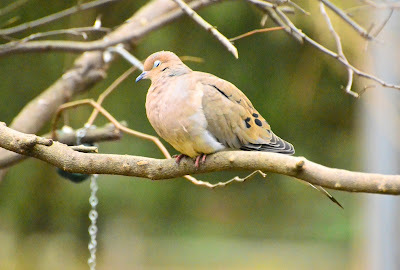 Having grown up in a city, surrounded by pigeons (which are actually rock doves, of course) which are generally very wary and crafty, moving to a suburb afforded me the opportunity to see more mourning doves. And they are very easy prey. Whereas pigeons will scoot very quickly, doves seem to look around a bit, as though they just woke up, and then try to take off, sometimes too late. Beautiful birds and I always love your captures, Reena! The Red-Bellied looks more like a red-head to me, but they are beautiful whatever!! Hope your week is going well!! Must be the time of year for the hawks. I had a juvenile red shouldered in my yard yesterday. Yours is definitely a grown up and strikes fear into the heart of all little birdies!!! They pert near ignored the poor little guy in my yard yesterday! Beautiful shots of some gorgeous birds. We have HUGE hawks here...one tried to swipe a puppy from my neighbors garden!!! It was a close call. Always love your bird shots, especially the ones of your hawks. 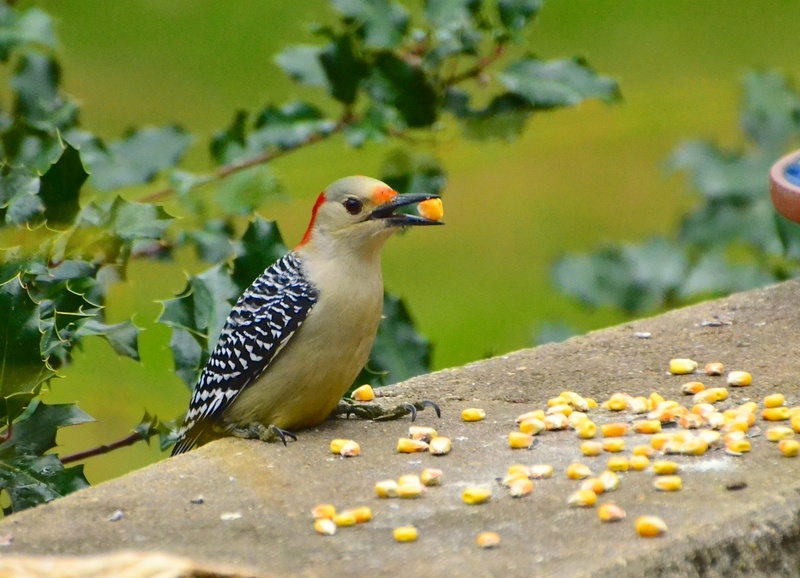 We've had the woodpeckers eating our corn too, I love seeing them. I love how she holds the corn in her beak!! I didn't know hawks went after worms!! He definitely looks like he's surveying the lunch counter, though. Great shots!! 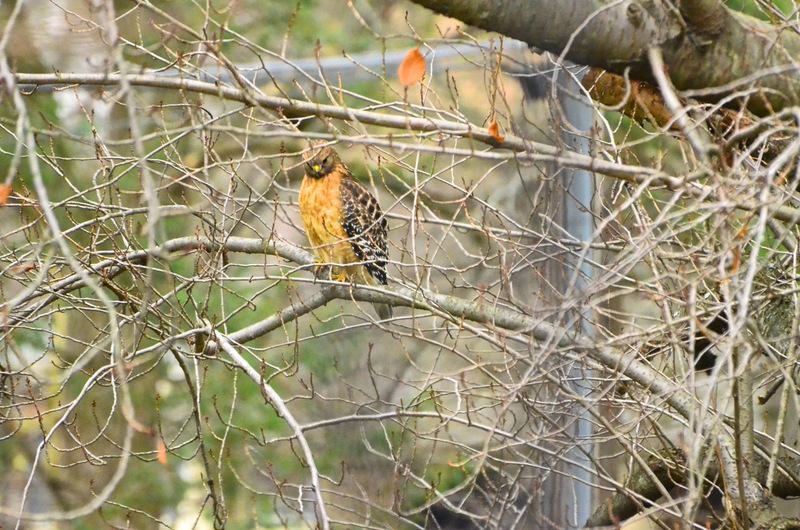 I thought it was too golden for a broad winged hawk but I'm not the expert in the family. It does look more like a red shouldered, especially in color and the tail feathers. 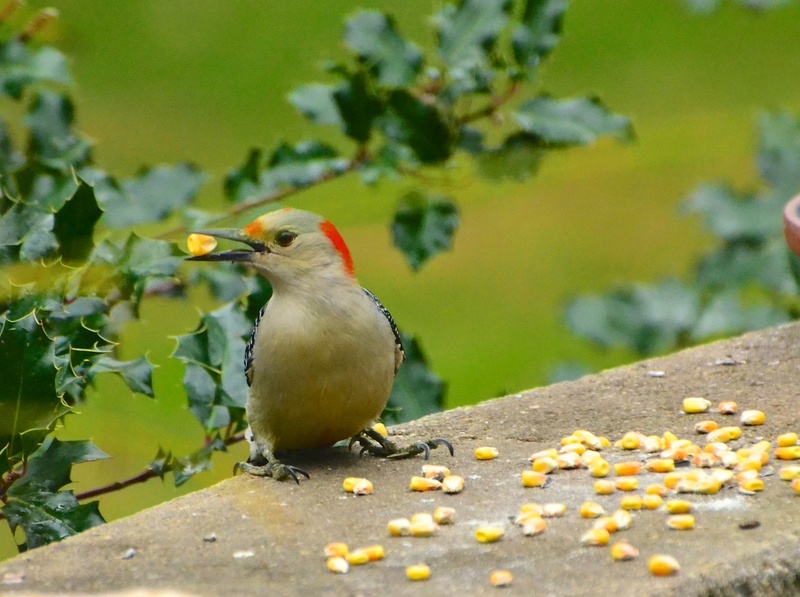 Woody Woodpecker is a beauty :-) Fabulous photos. Hi Reena...I would love to see one of these woodpeckers,..they have been seen here in some places,but are not a regular!! I love the second one with the head twist!! Pretty bird!! I can't help with the Hawks, I know my area ones,but that all! Such a sweet little woodpecker. 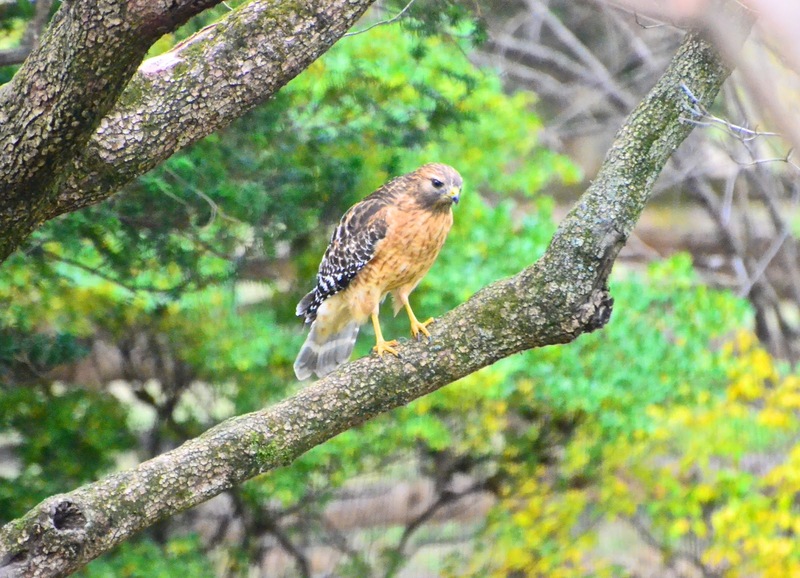 I agree that the beautiful hawk looks like a Red-shouldered Hawk. Nice captures of all. Great shots of the Redbellied. I have not tried feeding the corn. Awesome shots of the Hawk. I hope the Redbellied Woodies stay safe..
whoa, what a bird menagerie you have. wow, i just love it !! Reena, that little woodpecker is absolutely adorable, and what a beautiful series of photographs this is. I wish you and your family a most wonderful Holiday season. Oh your mrs red belly is so beautiful! That hawk is pretty awesome too. I'll be thinking of you in the lead up to Christmas Reena and hope that you will enjoy a measure of joy amid the sadness. Again, those photos amazing. What, do you live IN the tree? Do you have one of those 3 ft long white lenses you see on the sidelines of NFL games? Great shots as always. They are beautiful - be they predator or prey. The dove has given up. But the hawk let it go. Broad-winged or not he is gorgeous. I think it's sweet you show care and concern over the other animals that visit you, Reena. People who are nice to animals - well it says a host about them. Cheers!! Incredible shots, Reena! Not sure what type of hawk that is, but he is a beauty. Great job on focus on composition. Welcome back. What lovely pictures -- You live in a regular bird sanctuary! Maybe the hawks don't bother the chickadees because they're too little and too lean to be worth it! Your sleeping dove is cute -- the hawks must not bother about them too much either if you have so many. 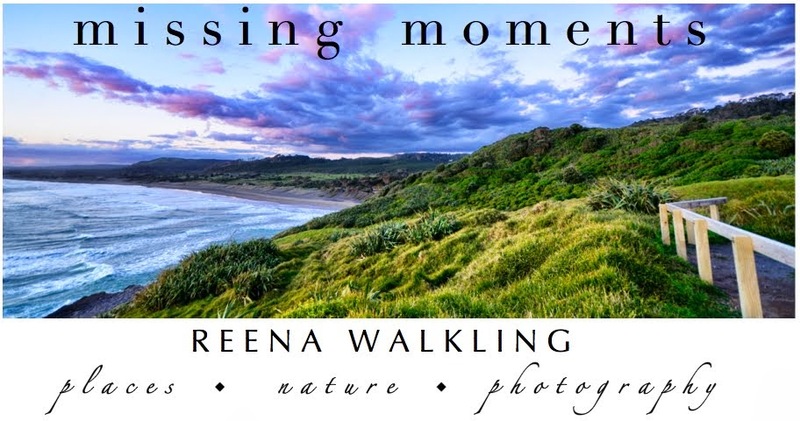 What a wonderful series of photos Reena! I too think it is a red shouldered hawk....and an absolutely beautiful one at that. These are wonderful photos, Reena. There's a little squirrel near the hawk in one of those images. Bold little thing! You were able to catch some pretty amazing shots in these images. Great work! Amazing captures...WOW!! And I know that feeling of losing these sweet birds to the hawks. Happy Weekend to you too!! Your pictures are so crisp I feel as if I'm sitting on the patio bird watching. The doves are surely slow and not the smartest of the flock either. Mom had to reduce the size of her photos last year. Also if need be we have instructions on how to delete older pictures from your picasa folder. Let us know if you would like them instructions. How fun to see so many birds at the feeder.. They are all gorgeous photos. Great shots. The woodpecker is so cute and the hawk so majestic. Such great photos that lift the spirits! The third photo is amazing. Great shots all together. Not sure what kind of hawk you got. I'm more into dog breads then birds. Hahaha! So many great captures. That woodpecker is so sweet! you just told a story with your wonderful photos.